1. Heat the oil in a large sauté pan. Add the pancetta and fry until crisp. Remove with a slotted spoon and set aside. 2. Add the butter to the pan and, once foaming, stir through the onion. Gently cook for 8 minutes. Add the garlic and cook for a further minute. Add the rice and toast until translucent. Pour over the wine and bubble until absorbed. 3. Over a medium heat, start to add the stock, a ladleful at a time, stirring between each addition and allowing almost all the stock to be absorbed before adding more. After about 18 minutes most of the stock will have been added. 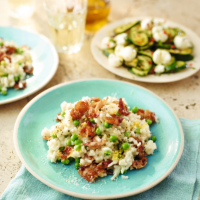 Stir in the peas, pancetta and lemon zest, and continue to cook for 4 minutes, or until the rice is tender and creamy and the peas are cooked through. 4. Remove from the heat, season to taste with freshly ground black pepper. Stir through the lemon juice, cream and Parmigiano Reggiano. Serve in warm bowls with extra Parmigiano on the side.